Welcome to the 2019 London Fire Department Probationary Firefighter Recruitment. Proud of its roots dating back to 1873, the London Fire Department today is a multi-faceted fire service focused on adapting to an ever-changing and dynamic community through continuous improvement and innovation. The strength of our Department comes from Our Team of 400 individuals dedicated to serving and protecting the City’s 383,000 residents, as well as tens of thousands of students attending Western University and Fanshawe College. Together, we work “together to strengthen Londoner’s quality of life… community-wide… neighbourhood by neighbourhood”. Fire safety education and prevention, which are the first two lines of defence, are the primary focus of our Fire Prevention Division; however, those responsibilities are also shared by all of our Fire Fighting Division Team members. Nonetheless, when emergencies do occur, fire related or otherwise, the Fire Fighting Division is trained and equipped to deliver fire suppression, auto-extrication, and defibrillation services, as well as specialty services such as Hazmat, Technical Rescue and Water/Ice Rescue. Other teams that make up the composition of our Fire Department are Training, Communications, Clerical, Apparatus and Stores Divisions... the individuals that train our staff, dispatch alarms, keep the fire apparatus running, ensure supplies are readily available, as well as assist in the overall organization and function of the Department. The London Fire Department strives to foster a workplace in which all individuals maximize their potential, regardless of their differences. We are committed to attracting, engaging, developing and celebrating exceptional people in public service who are representative of our community. We are proud to be a part of public service, working with dedicated people who go the extra mile striving for excellence and the personal satisfaction of a job well done. 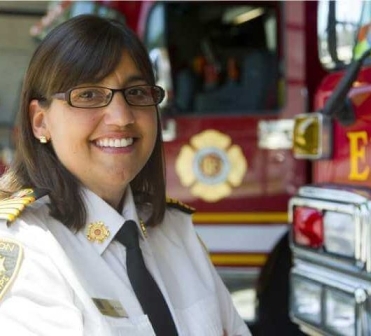 The London Fire Department will be partnering with Firefighter Recruitment Services of Canada to assist in the preliminary work of receiving applications. Please direct all inquiries through the portal that has been set up for the recruitment. Due to the high volume of calls we will be unable to return any call related to the position of Probationary Firefighter made directly to the City of London. Please read all the sections on this page carefully to ensure that you completely understand the process and requirements before applying. Register on this website: you'll need a valid, unique email address and a password of your choice. Pay the administrative fee (see below). Fill out application form online. This application must be completed and finalized BEFORE November 27th, 2018, at 6:00pm EST. Any costs incurred to obtain and/or provide supporting documentation are your responsibility. Non-refundable administrative fee of $150.00 CDN (plus 13% HST - #822318424RT0001) (payable via PayPal®, MasterCard®, Visa®, or American Express®) prior to application. Proof of Grade 12 Diploma in the Province of Ontario, GED and/or equivalent. Graduation from a NFPA 1001, Level II Firefighting Program with current IFSAC and/or PROBOARD endorsement. The City of London does accept online type courses for the above mentioned programs as long as they are PROBOARD or IFSAC approved. Valid and unrestricted Ontario class D driver's license with a Z endorsement (or out of province equivalent accepted) prior to application closing date on November 27th, 2018. Driver's Licence or Driver's Abstract with current and valid DZ class listed will be accepted if uploaded to online application prior to application deadline. Note: Out of Province applicants will be required to convert to a valid Ontario DZ license within 90 days of hire. You must receive full DZ licence prior to application close date on November 27th, 2018. DZ Licence and/or road tests completed after the application deadline will not be accepted. Note: Special consideration will be given to Technician Level Certifications for the above. Note: Special consideration will be given to EMR certification and CPR with AED. Please upload a copy of your original Driver's Abstract (a copy of a copy will not be accepted). If you already possess a 3 Year Uncertified Drivers Abstract, it must be dated from May 27th, 2018 forward. You can order the drivers abstract online via Service Ontario Website for $12.00. Any Driver's Abstracts dated after November 27th, 2018 will not be accepted. Driver's Abstract's are to be uploaded to online application before the application deadline of November 27th, 2018, at 6:00pm EST. Already Have a CRC with VSS? The City of London will accept your CRC with VSS if it is dated from November 27th, 2017 forward (no more than 12 months old). Need an updated CRC with VSS? If you do not have a CRC with VSS dated November 27th, 2017 forward, please apply at your local Police Station of the city reflected on your driver's licence. (eg: If your driver's licence address shows an address of London – you must apply for CRC with VSS in London. If your driver's licence shows Waterloo and you live in London; your options are: get your CRC with VSS in the city your licence is listed (eg. Waterloo). OR Update your driver's licence to reflect your current address with the correct city and obtain the CRC with VSS from your local police department. Not sure what to bring when applying for CRC with VSS? Please call your local Police Station to see if you require a sign-off/request form in order to apply for your CRC with VSS, and if so, kindly contact a FRSC team member and we will gladly email you one. For those applicants who reside in the Toronto area, Toronto police requires your request form to be printed on LEGAL sized paper. Keep your CRC with VSS receipt! While waiting for your CRC with VSS to be processed from your local Police Department, you may use your paid receipt as proof of applying. You may upload the receipt to your on-line application (once the portal is active on October 29th, 2018 at 8:00AM EST). Receipts must reflect a date on or prior to November 27th 2018 and must be uploaded to online application before application close date on November 27th, 2018, at 6:00pm EST. Only York University Firefighting Physical Fitness Tests will be accepted (The City of London will not be accepting CPAT's). Already Have a York University Firefighting Physical Fitness Test? The City of London will accept your York University Firefighting Physical Test certificate and consider it valid with a date from May 27th, 2018 forward. Need a York Fitness Test? Candidates can schedule their own assessment directly by emailing fityork@yorku.ca. Please email York Fitness ASAP as dates book up quickly. Note: the cost of this test is the responsibility of the candidate. Your York Fit Assessment must be uploaded with your other required documents to the online application before application close date no later than November 27th, 2018, at 6:00pm EST. All candidates applying to the 2019 City of London Probationary Firefighter Recruitment and have paid the administrative fee within the application portal (once the portal is active on October 29th, 2018 at 8:00AM EST) WILL write the pre-qualifying exam. This will be emailed to you when your application is finalized. You will also see your Applicant ID displayed in the top-right of this portal once you've registered and logged in. The Exam will be held on Sunday, December 9th, 2018. All candidates are required to be available on this date. Your specific exam time will be posted on the Announcements tab the week prior to the exam. Your Applicant ID will be used as a confidential identifier when your marks are posted on this website. Exams will be held at the London Convention Centre, located at 300 York Street, London, Ontario (Google Maps). We are not able to provide information regarding the type or name of the written exam.